ring a press conference the company called at its headquarters to discuss ongoing issues with the smartphone. Users who buy the new version of the iPhone by Sept. 30 will be able to sign up on the Apple website to receive a free case -- or "bumper" -- starting late next week. Users who already bought bumpers will receive refunds, he said. 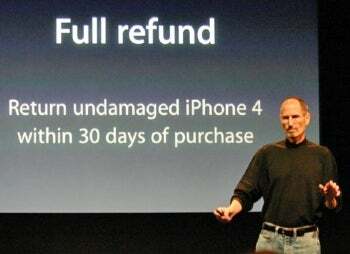 "And if you're still not happy, before or after you get a free case, you can bring your iPhone 4 back undamaged within 30 days for a full refund." The company knew that if users gripped the iPhone 4 a certain way that the bars of reception would drop, but didn't think it would be a big problem, he said during a 15-minute presentation in Cupertino, California. And, according to figures from AppleCare, the company's help desk, 0.55 percent of iPhone users have called to report antenna or reception problems, contrary to how it might seem based on the ongoing coverage of the reception issue, he suggested. "You know, we're not perfect," Jobs said at the start of his presentation. "And phones aren't perfect either. But we want to make all of our users happy. And if you don't know that about Apple, you don't know Apple." Since the problem was reported 22 days ago, the company has worked hard to find out "what the real problem is," he said, opening his presentation by saying that other smartphones have the same issues and then ticking off a list of competing phones. "Most smartphones behave exactly the same way," he said. "Now these phones were tested in areas of relatively weak signal strength, as other testers have reported. This is life in the smartphone world. Phones aren't perfect." AT&T has supplied Apple with data on drop rates, which show that the iPhone 4 does drop more calls per 100 than its predecessor, the iPhone 3GS, but the figure is still not substantial, Jobs said. The saga continued meanwhile with Bloomberg reporting Thursday morning that Apple's "senior antenna executive" told Jobs early in the design process that he was concerned the smartphone's design could cause dropped calls and was a "serious engineering challenge." Later Thursday, The Wall Street Journal published a similar story saying that the company released the new iPhone despite internal worries about its design. The "shroud of secrecy" around the phone meant that carriers were given less time than usual to test it and were provided with "stealth" versions of the iPhone 4 that disguised its shape and some functions and that could not be touched, making it difficult to detect the antenna issue, the Journal reported. Both that account and Bloomberg's cited anonymous sources familiar with the situation. The iPhone 4 went on sale to enthusiastic buyers on June 24 in five countries. Compared to its predecessor, the smartphone has a higher-resolution display, a faster processor, a front-facing camera, multitasking capabilities and a new operating system, iOS4. Apple said the iPhone 4 launch was the most successful in the company's history, with more than 1.7 million units sold in the first three days. The smartphone received praise initially, but users soon started complaining about reception issues, with signal strength dropping significantly if the phone was held in a way that covers the wireless antenna. Apple in a public letter said that there was no fault in hardware design and blamed the issue on an algorithm used to calculate the bars representing signal strength. The nonprofit publication Consumer Reports initially recommended the iPhone 4 as one of a top smartphone, but after testing antenna performance, questioned Apple's claims and pulled its recommendation. The publication also offered remedies to temporarily fix the issue, including the use of Apple's Bumper case to mask the antenna. Multiple lawsuits filed against Apple seek damages and injunctions to stop the sale of the phones until the problem is resolved.